Thank you for your interest in renting a music studio at 171 Cedar Arts Center. We have a long history of exemplary musicians who have followed their passion, and who find great joy imparting their knowledge to future musicians. We hope the following information is comprehensive, however, we encourage you to reach out if you are in need of further information, or if you’d like to schedule a tour of the campus. Contact Ann Recotta by email, Ann.Recotta@171CedarArts.org or by calling 607-936-4647 during business hours. 171 Cedar Arts Center rents studios A, B, C, D, and E, located in the Bruce House at 171 Cedar Street along with the Ensemble Room and studios F and G, located in the Drake House at 155 Cedar Street. Rental agreements are valid from September 10, 2018 through June 30,2019 (or as new instructors join us). All scheduling for studio use and recitals is managed through Ann Recotta, Administrative Manager. Rental requests for July 1 through August 31, 2019 must be submitted no later than May 3, 2019. 171 Cedar Arts Center reserves the right to close its campus, individual buildings or individual studios for construction, maintenance, etc., and select holidays. A programming schedule will be given to you no later than July 1 for the upcoming fiscal year. Rental payments are due the first business day each rental month, e.g., September rent is due the first day you hold lessons in September, not at the end of the month. If you wait until the end of the month a $20 late fee will be added to your balance due. The first rental payment for September is either $80 or $100, and is not prorated depending on your individual teaching hours. During July and August 2019, studios will be available for rent at $8 per hour or the regular rate of $80/$100 per rental day* of the week per month, whichever is most beneficial to the instructor. *For the purposes of our rental contract, a rental day means day of the week, i.e. Monday, Tuesday, etc. This breaks down to $20 per Monday, $20 per Tuesday, etc. not to exceed $80/$100 per month. 171 Cedar Arts Center does not provide Comprehensive General Liability coverage for renters. In the event of a claim of wrongdoing or misconduct, and in order to protect your own personal assets, we require that you secure a current certificate of insurance naming 171 Cedar Arts Center as “An Additional Insured” in the amount of $1,000,000 property damage per occurrence, $2,000,000 aggregate for Comprehensive General Liability. You will be required to upload a copy of your Comprehensive General Liability certificate when completing the online rental agreement form. A new certificate will be required yearly. Additionally, we strongly recommend that each renter seek renter’s insurance as added protection against damages. 171 Cedar Arts Center is not responsible for renter or client materials left in the music studios. 171 Cedar Arts Center has sufficient personal injury and property damage liability insurance with respect to 171 Cedar Arts Center’s property, content, activities of staff. As a part of your rental agreement you are required to sign statements waiving any and all claims and/or offsets that may arise from renting a space at 171 Cedar Arts Center, or resulting from the actions of your clientele or business interactions. 171 Cedar Arts Center requires that you submit a listing of all client/student names, addresses, email, and phone numbers to be kept on file at 171 Cedar Arts Center. Use the Client List Form to update your client/students in 171’s system no later than October 31, 2018. Changes to your client/student records must be provided as they occur throughout the year. Emergency contact and hold-harmless forms should be filled in by parents/guardians or responsible adults and all music instructors. We are required to keep them on file at 171 Cedar Arts Center. They will be able to do this through 171’s website as soon as it’s live. Until then, please share paper copies of the Emergency Contact and Waiver Form. The request should include a set-up description. Please submit the Theater Reservation Request Form to secure your desired date. Recital program photocopying can be done if original copy is provided at least one week prior to the recital. You can email a copy to Recotta@171CedarArts.org or bring in a paper copy. 171 Cedar Arts Center will publicize the names of affiliated music instructors on its website. Additional publicity will be provided at management’s discretion. 171 will work to place new clients by referring them directly to music instructors. We will work to publicize your recitals to show off to our community members the achievements of our talented musicians. As a part of your rental agreement, you are now required to submit one professional digital photograph of yourself and a bio. If you did not do this last year, you will need to submit both photo and bio this year. Your faculty contact information will not be included on 171’s website until this information is received. If your studio is full and you are not taking new students, please contact Ann Recotta as soon as possible. Your timely response to potential students who would like to study with you is a reflection upon you as a professional, and on 171 Cedar Arts Center. We appreciate your best effort when returning phone calls or email inquiries regarding teaching, and we are available to help you in instances when you might be traveling or away from your studio for any length of time. 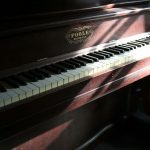 Studio pianos will be tuned semi-annually at 171 Cedar Arts Center’s expense. Additional tuning can be scheduled for $100.00 per tuning. Invitation to renew a prior year’s rental is at the discretion of 171 Cedar Arts Center’s management. Notification will be made in writing by September 10, 2018, if 171 Cedar Arts Center has elected to not renew an instructor’s rental agreement in the coming fiscal year. Each music instructor is required to submit a Music Studio Scheduling Request Form prior to teaching. All returning music instructors have been tentatively assigned to the same space and times as last year, however, this form is still required to confirm your schedule and specific times. Returning instructors should return this form no later than October 8, 2018. 171 Cedar Arts Center reserves the right to close due to its perception of inclement weather situations. If a closing takes place during your regularly scheduled rental time, a prorated amount will be noted on your rental account, and deducted during the last rental month of the rental agreement (June 2019). 171 does not follow the weather cancellations of local school districts. Cancellation notifications are announced on www.171cedararts.org, through email notification, local television stations, and on social media. We will make individualized phone calls to music instructors only if the weather has changed course mid-day. Please keep in mind that students, faculty, and staff, may commute from rural areas that include the Southern Tier of New York and Northern Pennsylvania – we work to consider all situations. Thank you for your devotion to your students, and for providing the best music instruction in the region!